Well I recently embarked on a new project: finally back to 28mm scale and this time the subject is a bipedal mecha I've dubbed a Centurion. Yes, it does seem like a certain GW concept but this is my interpretation of a "Romanesque mecha"
I started of by doing a lot of pictorial research, particularly at the details of Warmachine Warjacks. WIP shots of the various models at http://www.kallamity.com/ was also a massive inspiration in working out mechanical layout. Nobody tells you and I should have known from my SAW project that the biggest trick to doing a mecha is ensuring that poseability is going to work. So here I have some pictures of the progress on the leg design. Other than the thigh and lower leg armour all of the parts will be identical for each leg - only the armour plates will have the mirrored details. As it stands each leg will have 10 parts, although I might add one more as further detail. Yes, the lower leg armour plate is currently a card stand in. Hip joints will probably be ellipsoid spheres ("smartie" shape). I've not got any real plans for the torso yet, but the weapons will be mounted to the torso via very short piston type couplings rather than arms. mangozac wrote: As it stands each leg will have 10 parts, although I might add one more as further detail. I seem to remember you saying something along these lines with the Heavy Walker. How many parts did the legs end up being? *REALLY* looking forward to this project! blind pig wrote: How many parts did the legs end up being? blind pig wrote: *REALLY* looking forward to this project! Now I know why you dropped off the planet It's a pretty nice start, but do you have any pics of where you are going? I'm a little curious about it after seeing the foot. Also, how high is the leg, and the total height expected to be? Like I said, I'm drawing inspiration from a lot of sources, but none directly enough that I can use to say "this is what it will look like". Perhaps when it's time to start on the Torso I'll do something, but I find my drawing skills to be so lacking that these days I just mock up forms in clay. Barn: The leg will be between 3-4 inches tall depending on the pose. Overall height will be less than 7 inches. Zac... Im on the edge of my seat with this..... Its Tanks and Titans Im all about and brother this "mecha" is close enough to keep me subscribed.... I will watch with interest. It still obviously needs a lot of work. Something I've been agonising over since early in the project was the symbology to place over the mecha. I feel that it's the little skulls and eagles over GW designs that give them that extra level of interest and I wanted to do the same here. Of course, I won't be using the same symbols here so I set about coming up with my own. I wanted something fairly symmetrical and reminiscent of ancient Roman/Greek/Spartan aesthetics. i like it. 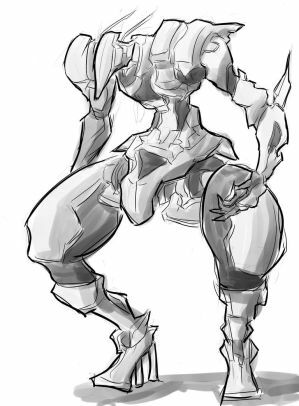 I think the extra armor is good ALTHOUGH I have noticed that with Mechas (FW/GW aside) they DO seem to have these spindly feet/ankles for the legs. Its very Japanamation eske and not entirely out of place. Maybe a shield that can be added or removed at will?? OH and the Lambda and wreath... Im digging that. fits grimdark well yet far enough from it. From the considerable amount of anime I have watched with big robots knocking the snot out of each other, both are good. 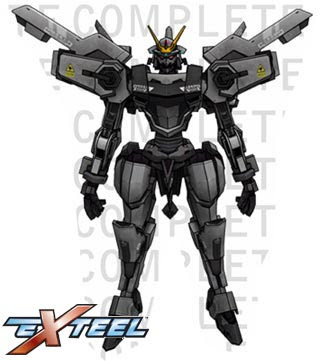 Mecha designers are fairly pragmatic, generally the faster, more lightly armed and armoured figures have the spindly feet, but heavy armour types have heavier feet. Also think of the diference between GW's crisis suits with the spindly feet and the broadsides with the heavier 'boots'. I would say, take the Gundam method. Keep the feet as they are ( they look great BTW ) for a lighter walker, but make a heavier 'overshoe' for anything mounting bigger cannon. Also, what putty are you using as a filler magozac? I am getting into plasticard myself and am looking for a filler for all those fine joints. LOL. I like the FW/GW armored legs. They are beefy and nice with a armour plate to protect. geomod wrote: Also, what putty are you using as a filler magozac? I am getting into plasticard myself and am looking for a filler for all those fine joints. The putty you see on the above shots of the foot is just Milliput which is my general putty of choice. Alternately for very small gaps (< 0.25mm) I use automotive spot putty. It's pretty noxious and stinks the place up but it's quick and you can sand smooth in around 1/2 hour.